Small-water greenheads may be the most addictive form of waterfowling there is. A mallard's love for cereal crops is no secret, with barley, soft wheat and field peas favorite food sources for migrating birds across the PPR, from Alberta in the northwest to Minnesota, Iowa and Nebraska to the southeast. Out here, the traditional approach to hunting greenheads is to spot them in fields where they're feeding, construct a blind, set out as many decoys as you have at your disposal, and lay in wait for the birds to return for another morning or evening feed. That strategy has withstood the test of time, bringing to hand many limits over the years, but it has its inherent challenges. Think of the work required to erect blinds and haul in and lay out extensive decoy spreads, only to suffer the frustration of birds that, for reasons known only to them, select another part of the field, a different field all together, or become extremely blind-shy. Pothole gunning mitigates all of these difficulties. Understanding mallard behavior is fundamental to pothole shoots, specifically the recognition that mallards prefer to water before feeding. Most will roost on lakes, reservoirs or rivers through the night, leaving these sanctuaries each morning to field-feed. When there's opportunity, they'll drop in to small sloughs or potholes before their morning feed. They may return post-feeding, or fly out to day roosts, but they'll generally return again prior to their evening feed. Finding active potholes is quite simple if you know what to look for. Don't be too hung up on wondering if the water is too small to shoot from. Mallards will continue to use small-waters until forced out by hunting pressure. Finding active potholes is quite simple if you know what to look for; it involves no more than the typical spotting most field hunters already conduct. Drive the countryside, watching for flights of birds early in the morning and in late afternoon or early evening. As the perfect mallard pothole is often only an acre or two in size, you may not be able to see the water itself but, (and this is key), you can usually tell it's water they're landing in by their flight behavior. While mallards will typically circle a field several times before sitting down, most often they drop onto a pothole quickly and directly. If you see birds disappear from the air quickly, assume that they're landing in water, even when it's not apparent. Don't be concerned that the water is too small to shoot — there's no such thing. I've had tremendous hunts on cattle dugouts and on sheet-water ponds 30 yards in diameter and less with no more than three or four inches of water. What you can be sure of, however, is that once mallards begin using these waters they'll continue to do so until forced to move because of hunting pressure. 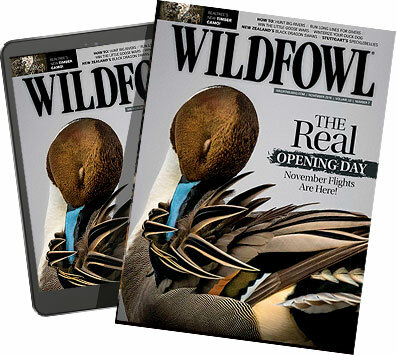 "Our most consistent and successful gunning invariably occurs when we've discovered a small pond that birds are using on their way to and from field feeding," confides Kevin Rolfe, the owner of Phantom Outfitting who's been guiding prairie mallard hunters since the early 1980s. "We treasure these locations because we know it's going to be a quick in and out operation, and our clients will experience what is generally the best duck hunt of their lives." Using the available cover around you on small waters can drastically improve your odds when hunting mallards. Nothing is better than what mother nature provides us while in the field when it comes to coverage. Typically, potholes that attract mallards will be found within a grain field, are often less than two acres in size, and are ringed by tall marsh grasses, cattails or willows. In these situations, the natural cover eliminates the need for an artificial blind; hiding within the dense native vegetation is always the preferred option. Where there is not an abundance of natural cover edging the pothole, you have several options. Simple blinds using metal poles strung with camouflage netting can be very effective, though it pays to add a little willow or cut grass to help disguise your location. In low water years, where the water's edge does not reach the natural vegetation around a pothole, consider setting up a blind with a front only, use the vegetation as the blind's back wall. Most of your shooting opportunities will be at first or last light, providing some leeway in concealment. In extreme cases, where birds are particularly wary or there's no natural cover whatsoever, layout blinds are extremely effective. As with typical field shoots, remember that mallards will always land into the wind, regardless of the direction from where they originate. As such, it's imperative that you set up your blind with the wind at your back. On potholes small enough to shoot across, or where birds are jittery, Rolfe often sets up a crosswind shoot so that approaching birds are not landing directly towards the blind. Use small spreads when hunting on small pothole's. There is no need to use decoys as attractors, per se, but rather a sense of confidence and security in those mallards that are already hard wired to come in, and to keep the birds on line relative proximity of the blind. One of the nice things about hunting small water is that it does not require a lot of gear. You won't need many decoys to effectively hunt these duck holes; if mallards are using a particular pothole for watering they will be back until they are shot off. Blaine Burns, owner and operator of Black Dog Outfitters, has hunted and guided across the PPR, and uses 10 to 20 floaters, sometimes less. I use decoys on small potholes not for attraction, per se, but rather to instill a sense of confidence and security in those mallards that are already hard-wired to come in, and to keep the birds on line relative to my blind." There's no need to set up your decoys in any particular pattern, he suggests. "Keep them evenly spaced in loose groups, weighted towards the downwind side of the slough. Mallards prefer to settle having flown past decoys before landing, so you want your landing zone located on the side of the pothole nearest your blind." Motion decoys aren't necessary when mallards are patterned to a specific pothole. At least not the first time you shoot it and usually not the second time, either. If you want to push your luck and shoot a pothole a third or fourth time, however, motion decoys are invaluable to re-instilling confidence in approaching birds. When shooting a pothole that has grain stubble almost to the water's edge, it can help to add a dozen or two silhouette decoys in the field behind your blind, but it's not absolutely critical to success. Pothole mallards will occasionally feed in the same field as the wetland where they water, and in these cases it's not uncommon to see birds walking to and from the slough and the field, alternatively feeding and watering. Rest assured, however, that the birds will always come in to the water first, and that's where you want to be set up. Less calling usually equals more ducks on small pothole locations. Sometimes, leaving your loud, outrageous, sounded calls at home, is the ticket when hunting weary mallards. There's an old saying that "silence is golden" and that's an adage worth recalling when hunting potholes. Watering mallards are either patterning to a particular wetland or they're not. If you haven't done your scouting, and the birds have not been using that slough, seldom will even the best calling bring in many birds. And if they're already planning to come in, calling runs the risk of repelling approaching birds — unless you are very proficient in the language of ducks. And that's the caveat. Truth be told, most of us are adequate callers at best. Fore more accomplished callers, however, there's always benefit to calling because authentic quacks do provide birds confidence. This isn't the time or place to be harassing mallards with your repertoire of hail calls, come-backs and aggressive feeding chuckles, though. The birds are already patterned and they aren't feeding on these puddles. The most effective calling regime, if you insist on calling, is one that imbues contentment. Remember that you've got a small decoy spread — imitating one or two cheerful hens through periodic quacking has proven to be most effective. Burns says over-calling is often an issue, especially first-timers. "They're unaccustomed to hunting mallards where loud and aggressive calling isn't necessary. I suggest that they leave their calls at camp, but if they're insistent I coach them to call quietly and passively. Invariably, once they've experienced the spectacle of one of our pothole hunts, they come to understand that when it comes to calling, less is usually more." When a pothole mallard hunt comes together as planned, you'll be shooting your birds at close range, typically inside 30 yards and often inside 20. Their breasts and feet will be extended, making these among the easiest shots at ducks you'll ever encounter. As a result, open chokes and relatively light loads are the rule. In 12-gauge, an improved-cylinder, shooting 23â„4-inch No. 4s, 5s or even 6s is recommended. As the season progresses, and the birds continue to fatten up and feather out, effective penetration becomes more of a challenge, so some move up to 3-inch loads, but that's more the exception than the rule. If you're partial to 20- or 28-gauge shotguns, pothole mallards are ideal, as you're seldom shooting at extreme distances or angles. As Rolfe is fond of saying, "We could kill them with rice at this distance!" For those seeking to score their first true triple, you'll never have a better opportunity than on a pothole shoot. Leave dogs kenneled until after the hunt, at which time they're brought out to assist with the pick-up. Mature, veteran hounds, that listen and obey commands on the regular, can be left out and used to pick up birds that have sailed to extended distances. Veteran pothole hunters are split over the value of a dog on these hunts. The gunning can be fast and furious as the ducks, particularly in the morning, arrive quickly. It can be chaotic trying to manage the confusion of multiple birds dropping with little time between volleys. From a practical standpoint, finding downed birds is seldom difficult. They'll either drop on the water or, if wounded, paddle into the narrow band of perimeter vegetation. Alternatively, they'll fall in the adjacent stubble, from where they'll seldom wander far, even when wounded. As a result, it's common to leave dogs kenneled until after the hunt, at which time they're brought out to assist with the pick-up. If your dog is steady to the shot, however, and handles well to the whistle or hand signals, they can be valuable in ensuring rapid retrieves on wing-tipped birds that sail extended distances. More often than not, however, you'll find that the close-in nature of these shoots results in few wounded birds. Mallards patterned to a pothole will use it religiously, particularly if they're not disturbed in the field where they're feeding. As a result, it's common to get two, three and occasionally four quality shoots out of a single one acre puddle before the birds move elsewhere. Burns recommends shooting them only once a day, though confesses to having taken two different groups of hunters onto the same tiny pothole day and night for two days and watching them take limits on each shoot. Until you've seen it, you won't believe how many mallards can fit onto an acre of water. Put your time in spotting (Rolfe advises it's the single biggest difference between successful and unsuccessful pothole shoots) and set yourself on a puddle for mallards. Once you've tried it, you're likely to never shoot the stubble again.